Spring is in the air and this weekend, the season’s sights and scents will take over the exhibit floor at a Balboa Park museum in an annual tradition that fuses flowers with famous works. 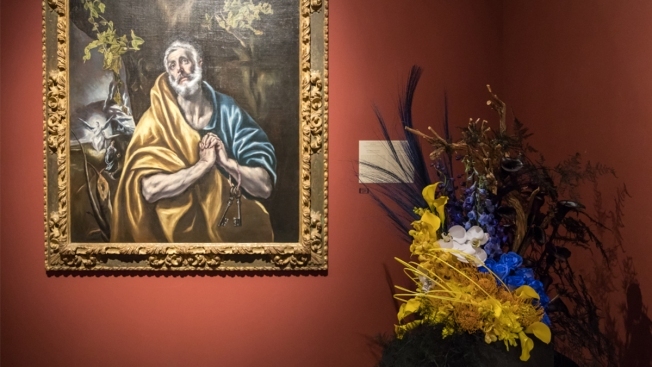 The 2019 Art Alive exhibition takes place Thursday through Sunday at the San Diego Museum of Art in Balboa Park, an exhibition featuring nearly 100 floral designers’ interpretations of some of the museum’s masterpieces. The floral arrangements will be displayed next to each corresponding artwork, so visitors can take in both versions at the same time. Art Alive will also fill the museum’s famous, two-story rotunda with flowers, turning the entrance into a breathtaking centerpiece. This year, Venice, California-based Floral Art founder Jennifer McGarigle will spearhead the rotunda design. She will model her display after “Alfred Eisenstaedt: Life and Legacy,” a photography exhibition that opens this weekend at the museum. The Art Alive tradition blossomed 38 years ago. Today, for one long weekend, the flower arrangements transform the museum galleries into a field of color and springtime aromas. Organizers say the museum expects about 12,000 visitors to stroll through the Art Alive exhibition over the course of the weekend. Art Alive will be on display Friday through Sunday, from 9 a.m. to 5 p.m., during the museum's regular hours of operation. A black-tie premiere dinner Thursday will kick off the weekend event; the annual “Bloom Bash” follows Friday, an opening celebration from 7 p.m. to midnight featuring art installations, food, cocktails, dancing and live performances. This year, organizers say the Bloom Bash will be grander than ever, expanding into Balboa Park’s Plaza de Panama to accommodate the growing guest list and 45 food vendors. Art Alive is the museum’s biggest fundraiser. Proceeds keep the museum’s education and outreach programs blooming year-round. Art Alive is included with paid admission into the museum, which costs $25 for adults and $5 for youth ages 7 to 17. Children under 6 get into the museum for free. Tickets to the Bloom Bash cost $250 apiece. On Sunday, from 12 p.m. to 4 p.m., the San Diego Museum of Art will host the “Garden of Activities” amid the final day of Art Alive, a lineup of family-friendly activities including a museum-wide flower hunt, nature-inspired readings for the kids, and art projects. Those activities will be free with paid admission into the museum. To get more details on the 2019 Art Alive schedule, visit the San Diego Museum of Art’s website. The museum is located at 1450 El Prado, in the heart of Balboa Park.